1. Chivalry - This is one of the most important ideals in the SCA. As in Medieval times, this refers to the code of behavior worthy of a knight. Chivalry involves courtesy to all, generosity, loyalty, willingness to aid others, and honoring others and remaining worthy of honor. You can see examples of this when some gentle (person) holds open a door for someone who is laden with baskets (and especially if the gentle goes the extra mile and takes the baskets after holding the door), when a fighter on the field will take his own arm or leg to even a fight, or when a lord or lady gives reverence to the King and Queen's throne in respect to the "Royal Presence." All members strive to be chivalrous in their dealings with other members. This means giving up your seat to others more weary, volunteering time at troll or in the kitchen, making sure you never bounce a check to a merchant, and saying nothing which would anger or offend someone on purpose. 2. Speaking Forsoothly - This is basically an attempt at speaking the same way you would if you lived in the Middle Ages. This is not necessarily using a European accent (or speaking a foreign language, although some gentles do learn the native languages of their persona). Speaking forsoothly is using Medieval forms of address, such as "Lord" or "Lady," or using Medieval greetings, such as "Good Morrow," or "Well Met." This gives a real feeling to your persona and lets you experience some of the fun of the Society. Give it a try and see how others respond. 3. Leaving the Mundane World at Home - This is one of the easiest things to do in the SCA. When at an event, try to remember not to discuss anything which exists in the "real" world, i.e. work, sporting events, computers, cars, etc. Occasionally these things do come up, so don't be surprised, but generally it's better to try to find period things to discuss. Another thing which falls under this category is hiding things at events which you want to bring but don't want to look at. Take your watch off and put it in a pouch. Bring your cooler, but cover it with a cloth to make it look more like a table. If you must drink cola, put it in a goblet. Doing these things helps keep the modern world at home. 4. Feast Etiquette - Register for most feasts early, by mail if possible. You must bring your own equipment. You may have to pick your seating arrangements ahead of time - find out when you check in at Troll. If it's pot-luck, a good rule of thumb is to bring enough to feed yourselves. Try to keep food as authentic as possible. If you don't cook, bring fruit or cheeses. Feasts are served in several courses or removes (served to Royalty at the head table first). Take a little of each dish and pass it on, as there will be plenty more coming. It's somewhat rude to take a big portion before everyone at your table has had a chance to take a small portion. There will be toasts during the meal. The first toast is always to the Crown, made by the senior ranking gentle present, then to the Prince and Princess, the Baron or Baroness, etc. Usually gentles respond with "Hoobah," or "Wassail," or in the East, "Vivat." Be polite to others at your table, to servers, entertainers and heralds. If you aren't feasting, you could volunteer to serve or help in the kitchen or clean up. 5. 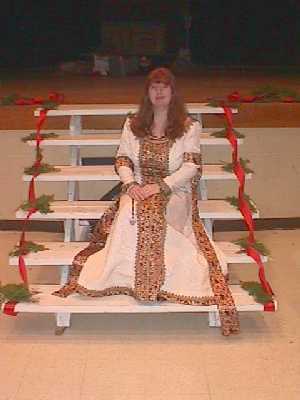 Courtly Behavior - Court is one of the most exciting things about the SCA. There are a few things to keep in mind. You should bow whenever you pass the Royal Presence. This is passing within 10 feet of Royalty or within 10 feet of the thrones even when Their Magesties are not seated! You should stand if possible as the herald announces Their Magesties' approach. They will then give you leave to sit once they are ready. Generally awards begin with the lesser award (winners of tourneys, Awards of Arms) and work up to larger awards (Laurels, Pelicans, Knighthood). This is a good way to start learning about awards. Only kingdom officers and those invited may approach the Crown during court. If you are called during court, you should remove any weapons quickly, approach the thrones, bow in the center aisle a few feet from Their Magesties, and then again when you reach the guards. Kneel on the cushion in front of the throne and accept whatever They choose to give you. When leaving, do not turn your back to the throne - take about 3 steps backward, bow, and then turn and leave. If you have business with the Crown during court, find the Herald earlier in the day and let them know you have something to present, etc. 6. Remember to Research - Be Authentic SCA members try to do as much as authentically as possible. This means that polyester garb is not acceptable except as a first attempt (and then hopefully not), and elves, hobbits or sci-fi personas are frowned upon as well. Remember that we are trying to recreate the Middle Ages as they should have been (so if you were a vampire, we'd chase you down, stake you, decapitate you and burn you). As you grow in the SCA, your knowledge of the Middle Ages should grow as well. Find things that interest you and research them as thoroughly as you can. Even if you only have time to learn about just one aspect of the Middle Ages, like the Crusades or Costuming, try to find out all you can, from primary sources if possible, and incorporate it into your persona. You could be a fighter who has returned from crusading, for example.